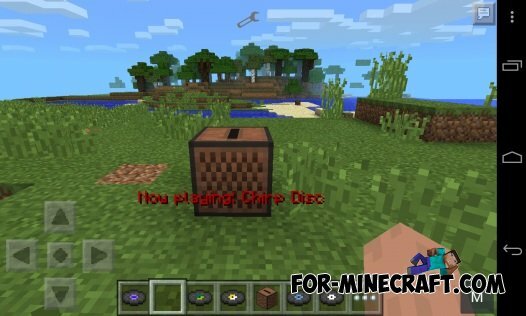 - There are twelve different disks with twelve different songs (songs transferred from Minecraft PC). - Click on the machine with the disk, and it will start to play the selected song. - Support for multiple jukeboxes that play simultaneously. - There is a coincidence to find the disk after every 30 murders a hostile crowd. - Click on the Jukebox, to eject the disc. When the song ends the disc is ejected automatically. - Block Jukebox discs and also in the creative inventory. - Craft recipe Jukebox is the same as in the PC version. GTA San Andreas mod v2.8 for Minecraft PE 0.9.5You know the game / Play GTA San Andreas? So, make a Minecraft mod like GTA, and you the hero of the game - namely, none other than Carl Johnson, or C-Jay.